nail care products. Their polishes are 3-Free and vegan, and they offer 72 shades as well as nail appliques. 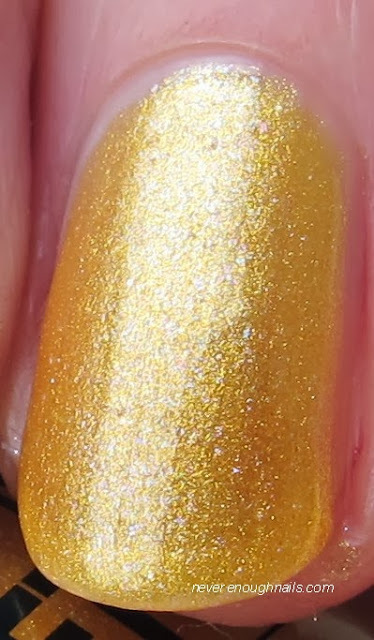 A Star Is Born is a stunning shimmering yellow gold polish with tiny iridescent glitters strewn throughout. The minute I saw this in the bottle, I knew I would love it. I am always looking for gorgeous real yellow gold polishes. I couldn't quite capture the iridescent glitters in the pictures, but they are visible in person and add a unique element to the polish. Having never tried a Color Secrets polish before, I wasn't sure what to expect. The formula turned out to be quite nice and easy to work with, maybe a tad on the thin side, but not a problem. This polish was opaque in three coats to my eye, but I did a fourth because I know my camera likes to make shimmery polishes look sheer. Warm me up reminds me of club eyeshadow from MAC!